Today most people reach the Morris Island lighthouse by boat. It is no longer open to the public to visit or for climbing (and with good reason since it is for all intents and purposes an island all it’s own in water known to be a breeding and feeding ground for sharks). It’s an iconic Folly Beach must-see for all who visit the Charleston, SC area. 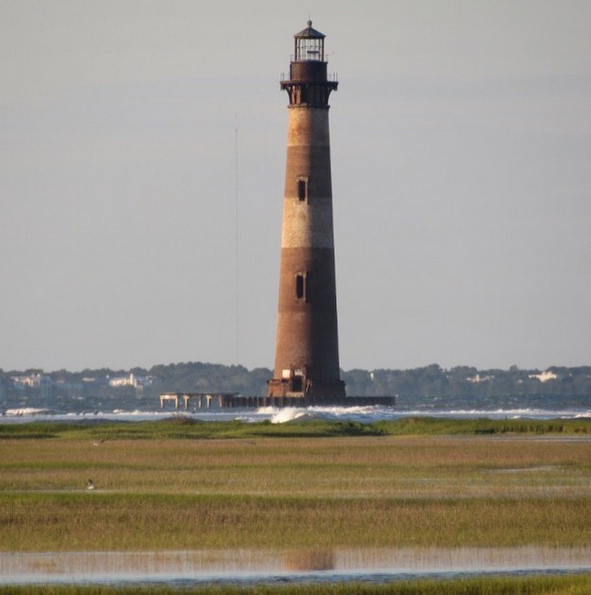 To get the best view take a drive to the end of East Ashley Avenue and find legal street side or cul-de-sac parking and then make the short hike up a well-traveled path in the dunes to the hidden beach at Lighthouse Heritage Preserve. You’ll find this stunning reminder of days gone by still holding strong (despite losing it’s buildings in Hurricane Hugo). It is well worth the hike if you are at all able to make it!